Welcome to Waffle Wednesdays here at Sweet Anna’s! Sponsored by one of my favorite shortcut foods… Eggo brand waffles! Today, we are talking about easy after school (or anytime!) snacks. I am having a bit of a hard time getting back into the swing of school year eating. Lunches to pack, snacks to prepare, starving kids to hold off until dinner time… I am always looking for new ideas when it comes to lunch and snack time. I know quesadillas are always a crowd please, but seriously… I get a little sick of making them. every. single. day. I especially love to surprise my kids with fun, different ideas when it comes to food. I think everything tastes better when it’s a bit more fun! When I asked the kids for ideas of what treats to try out with waffles these next several weeks, pizza was one of the first suggestions. I have yet to find a pizza I don’t like, so it didn’t take much to twist my arm on that one. I know, I know. It sounds a little bit weird, but hear me out. 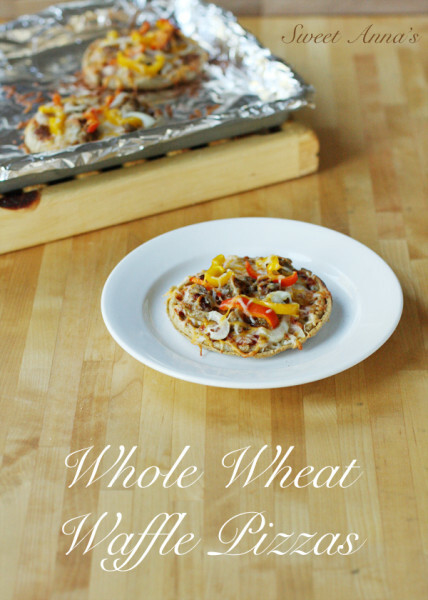 Whole Wheat waffles, toasted and then topped with all your favorite pizza toppings (each person gets to individualize their own! Yay!) thrown in the oven for about 10-15 minutes and voila! Hot, delicious, easy snacks around! 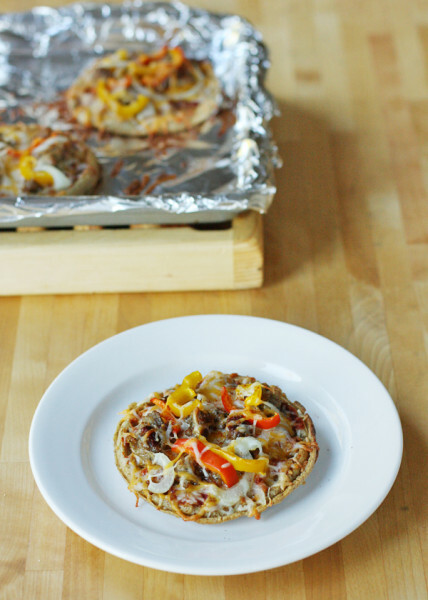 Also, a super easy light lunch or dinner idea… fun for kids no matter when you make them! The recipe is below is really just a suggestion. Customize to your liking! Just don’t forget to toast your waffles well before you top and bake them. Curiosity is just killing me right now, by the way… What are YOUR favorite pizza toppings? Preheat the oven to 450ºF. Line a baking sheet with foil and set aside. Toast the waffles, until they are very well done (but not burnt!). They will soften a bit with all the sauce and toppings, so don't be scared! Place the waffles on the lined baking sheet and spread on a generous layer of pizza sauce (1-2 tablespoons for each pizza) depending on how saucy you like it. 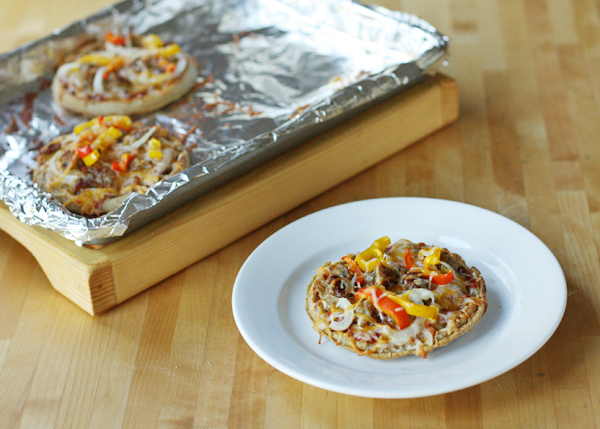 Sprinkle with cheese, all your favorite toppings and a bit more cheese on top of that. Place in the oven and bake for about 10-15 minutes, until the cheese is melted and golden!